What’s new at the garden? Years ago I created a rendering of an unusual plant that was in bloom in the mountainous rain forest of Trinidad. 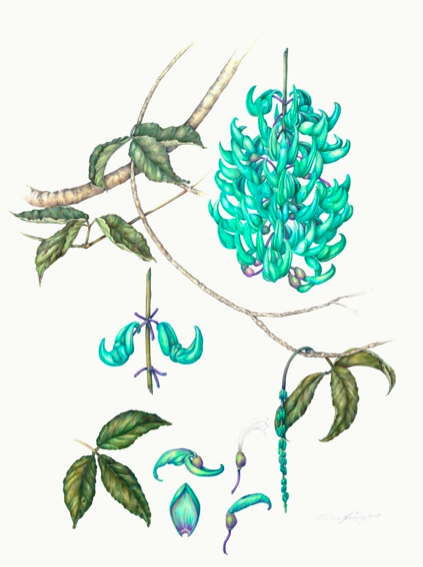 The Jade Vine, (or Strongylodon), was in full bloom and hanging from the overhead terraces of a garden, somewhat similar to the way a Wisteria grows. I had never seen blooms the color of sea foam with purple stems. The blossoms cascaded downward, sometimes 4 feet in length. As the blossoms fell off the stem, they formed a turquoise pyramid on the garden floor. Months later I was thrilled to find that the Enid A. Haupt Conservatory at the NY Botanical Garden had a healthy specimen in full bloom in the spring. I tripped over it while visiting the annual Orchid Show in February. Well, there is a plant of a different genus but just as spectacular and in bloom right now at the Conservatory. 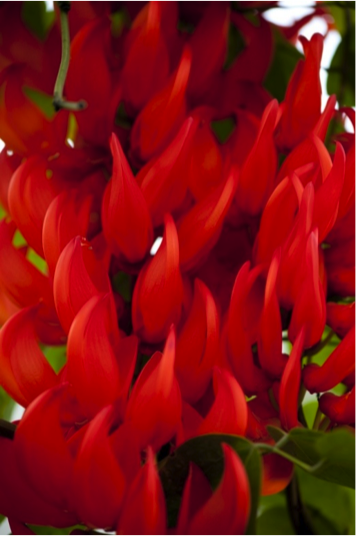 The Red Jade of the South Pacific, (Mucuna bennettii), a two year resident of the Garden, displays vibrant coral red blossoms for the delight of its visitors. It’s quite the alternative to the popular poinsettias during this Christmas season. If you are travelling down to the Holiday Train Show at the Garden, be sure to take the time to enjoy a visit with this spectacular plant in all its glory. If you simply can’t get away to the Bronx during this holiday season, keep in mind that the Orchid Show is just a couple of months away and the green Jade Vine will be waiting for you.